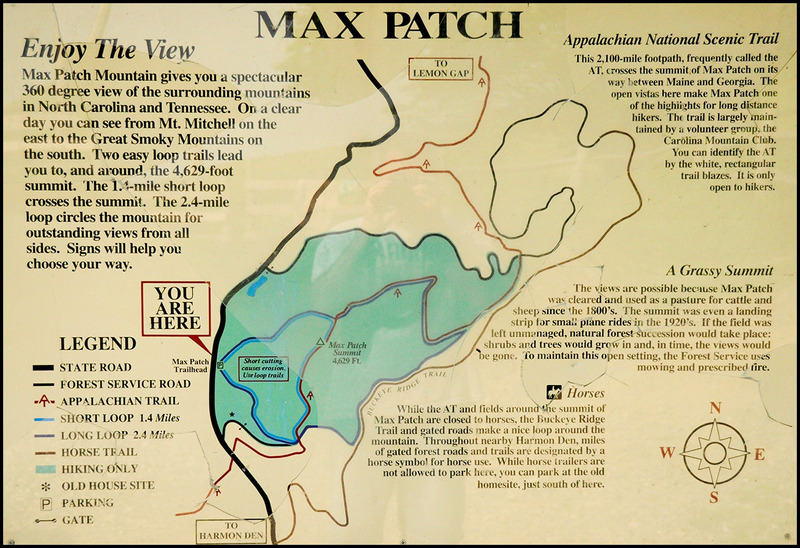 Max Patch has always been on my radar -- but it was just far enough out of the way, that I never visited until now. This one's definitely worth the drive. It's not the tallest (only 4629'), but yet this gem offers some of the most spectacular views found in the southern Appalachians. These photos really don't do it justice - it's huge - over 300 acres - and the views (even on a hazy day) are magnificent, breathtaking in every direction. Here's a panorama looking west toward the Smokies....because of the haze, not all the ridges in the distance appear (click to enlarge). But just imagine this scene on a cool, crisp autumn morning! While the origin of most of the balds in our region is subject to debate and speculation, the origin of Max Patch is known. In the 1800s, this knob was cleared and turned into farmland for cattle and sheep. For a time in the 1920s it was even used as a landing strip for small planes giving aerial tours of the area. To maintain the views, the forest service mows the bald each year to prevent reforestation. We came in following the road south of Hot Springs. It offers many beautiful views and country scenes, but I had dubbed it 'The Corkscrew' (update...Just found out others call it The Rattler), both are appropriate! Eventually, you turn off the main road and follow a gravel road for many miles. So not only is it remote, but it's also slow going. I thought it would be a bit more straight forward coming in from I-40, but the descriptions of that route seem to indicate the road turns to gravel and is slow going as well. Anyone care to comment on that approach? Parking is limited, so I recommend going early or on a week day. And while plenty of cars were in the lot, I was glad to have a high clearance vehicle for the rough gravel road. Ran into a couple of through hikers while there, always fun to talk to them about their experiences. The one on the left is from Massachusetts, the one leading the way is from New Mexico. The AT crosses over Max Patch, and both of these hikers commented on how the views and the cool breezes 'made their day' after hiking through the sweltering heat. In that sense, it reminded me of the balds on Roan Mountain - where it's always 10-15 degrees cooler than down below. Here's a photo of the map of the immediate area (sorry for the low quality, the plexiglass in front of the map was broken). You can see there are various trails that loop around the bald. I recommend taking the loop trail to your right at the parking area -- take it until it meets up with the AT and then take the AT to the summit (see this post). Detailed directions from Hot Springs and Asheville here. 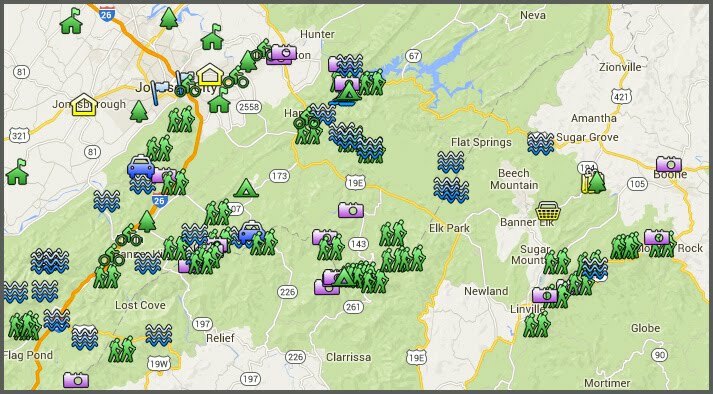 Map showing route from Johnson City to Hot Springs, NC to Max Patch. Thanks for the post. 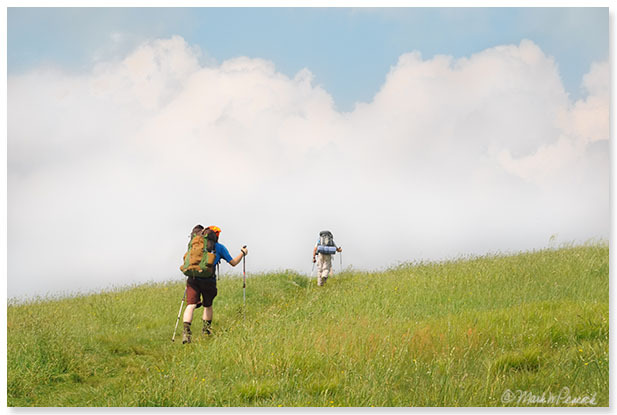 I'm considering taking the family up to Max Patch. This information has been really useful.